I formerly had the JSON API and JSON USER API plugins working before 4.7 and I have seen the documentation at the ReST API User reference, https://developer.wordpress.org/rest-api/reference/users/#create-a-user%20%22ReST%20API%20reference but I don't know how to get started. I'm sure there is an authentication procedure that must happen first to get a nonce, but I don't know how to do that anymore either. I'd really appreciate it if someone would show me or point me to some example cURL statements and URI's for both getting the nonce and creating a user. The REST API included in WordPress doesn't actually have authentication built into it. If you do normal authentication in WordPress by logging in, then your browser will receive a set of cookies. If you send those cookies along with your request, then that will authenticate you to perform the actions in question. In any case, once you've either gotten the proper cookie or enabled the authentication method, then creating a new user is simple. Send a POST request to /wp-json/wp/v2/users with the username, email, and password as the payload. The simple solution is use this wp-rest-user plugin. This plugin full fill such requirement by extending the existing WordPress REST API endpoints. 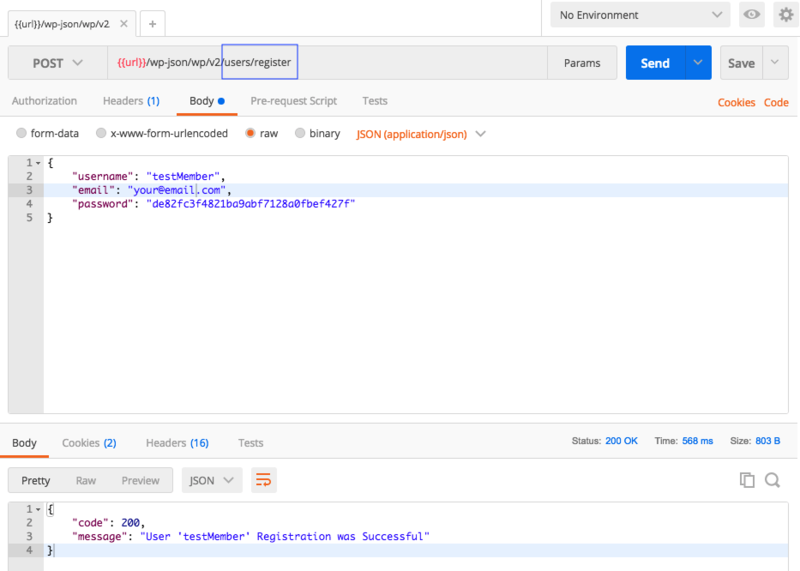 Send a POST request to /wp-json/wp/v2/users/register, including a JSON body with three keys: username, email and password. Send a POST request to /wp-json/wp/v2/users/lostpassword, including a JSON body with three keys: user_login. Hope this answer can help many people out there. Happy Codding. Not the answer you're looking for? Browse other questions tagged user-registration json rest-api nonce or ask your own question. node-wpapi: how to handle authentication?